Taking place just once every 2 years, the Farnborough International Air show is one of the most iconic events in Hampshire, if not the world. Held at the historical Farnborough Aerodrome in Hampshire – the birthplace of British aviation, the show features a jam-packed flying display both on the ground and in the air, as well as a multitude of entertainment features. At Scott’s Travel our team can help you organise corporate hospitality at various events in the UK and across the World including major sporting events such as football, F1 motor racing, tennis, golf and much more. Professionals at managing group travel bookings and transfers you can feel confident when booking with Scott's Travel that every detail is covered. 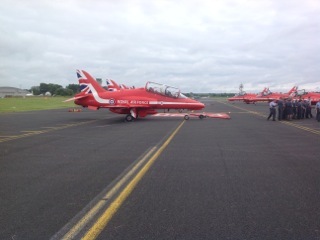 Lloyd recently spent the day at the Farnborough Air show, enjoying an exclusive view from the runway balcony. A three course meal, drinks and coffee were included in the £180 ticket price. Money well spent for any plane spotters out there! Please ask our team about our hospitality packages.